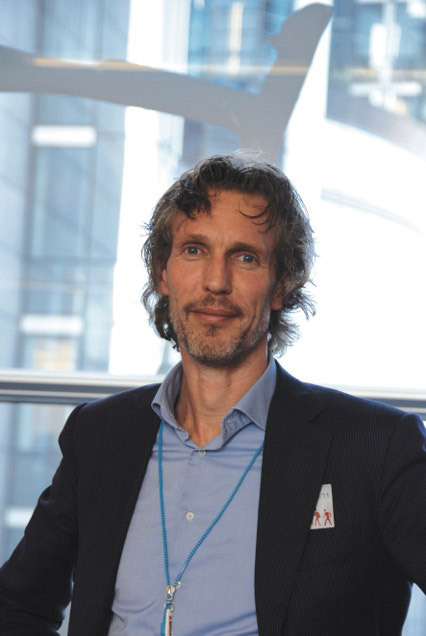 Professor Bastiaan Bloem is a consultant neurologist at Radboud University Nijmegen Medical Centre, the Netherlands. He was elected the ‘national healthcare hero on patients’ centredness’ in his native Netherlands in 2012 due to his innovative Parkinson’s work. I once gave a presentation to healthcare providers, patients and policymakers in Maastricht in the Netherlands. The presentation was entitled ‘From God to Guide’ and it called on doctors across Europe to embrace the concept of “participatory health for everyone”. My idea was simple. I wanted to tell my peers that I think it is time that doctors “descend from their ivory towers” and become guides (or coaches) in the lives of their patients. The presentation began with me – representing the traditional doctor – rising to great heights (using a forklift and guided by singing angels and a beam of light) and talking to my newly diagnosed patient, Hans, from high up in my ‘tower’. Following a brief, disinterested discussion about Han’s symptoms, I threw a prescription down to him where it fell feebly to the floor. He walked away alone and pressed a big, red reset button. Immediately, the light went off, the angels stopped singing, and my forklift descended back to baseline level. I left the forklift, took my white coat off (in real life, I never wear a white coat!) and put my hand on Hans’s shoulder. That was the first part of the talk. What followed was a discussion in the new ‘world’ that Hans had now created, a world where there was “no hierarchy” between patient and doctor. I began by playing him a film that showed the power patients have to compensate for their disease. A man with late-stage Parkinson’s and severe walking difficulties told me he could still ride a bicycle without difficulty. I was surprised by the claim and took him outside to see for myself. I thought it would be impossible but was amazed to see him in total control of his Parkinson’s and his pedals. It was striking evidence that even though patients have severe difficulties, they often have remarkable abilities too. I have since received hundreds of letters and emails from patients around the world who report similarly remarkable abilities to compensate for their disease. And the most important part of it all is that they knew the truth all along. It is us – the doctors – who don’t know the truth, even though it stares at us in the face all the time. I wanted the audience to witness a remarkable transition in just a few minutes, which saw a doctor who was once a ‘god’ descend from his ivory tower to become both a teacher and an equal partner in the healthcare system. I wanted to exemplify a world where doctors and patients could work together on a mutual basis. Make no mistake, though: this is not a world where patients are ruling the roost and bossing their doctors about – a fear that some of my more conservative colleagues hold. The truth is, this isn’t what patients want. They want to be taken seriously. They want to take an active part in their own disease management process. For those doctors still hesitating to make such a transition to participatory healthcare, think about the following exciting possibilities. Firstly, by starting to see patients as ‘clients’ we’ll begin to move the healthcare system a huge step forward. Patients can become great sources of inspiration – just like the patient in the bicycle video. I am regularly surprised by the power my patients display in overcoming all the difficulties they encounter every day of their lives. We, the doctors, are under utilising that power. Too many of us still see them as passive objects instead of active subjects who can contribute to their own health. Engaging with your patients will also prove to be cost-effective. For example, doctors usually tell their patients to return to their clinic after a fixed period of, say, three months. But if things go wrong that’s too late, whereas if things are going well, then it’s too early. An interesting alternative approach was studied in a randomised clinical trial that focused on patients with inflammatory bowel disease. One part of the study saw the traditional doctor call patients back in a few months’ time. In the other part, however, the patients were left to come back whenever they felt the time was right. And you know what happened? They came back less often. The number of no-shows went down and the patients always returned exactly on time because they decided when to come back. 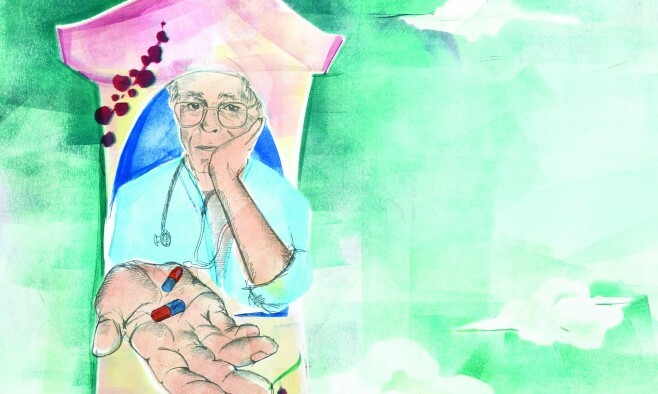 These are just a few wonderful examples of how engaging patients is a simple solution to both improving the quality of care and reducing the costs. It is a simple choice. I chose my job because I am passionate about healthcare and I have compassion for my patients. For me, seeing a patient as a sparring partner in the health process is the only way forward. And working as a doctor becomes so much more pleasurable when patients are treated as active subjects. I finished the presentation by sharing a secret ‘wish cookie’ with Hans (who is a real patient of mine). It said simply: “Participatory health for all of us.” I hope that wish comes true very soon. This article originally appeared in EPDA Plus. Illustration by Sophie Rae. Read ‘Neurologists should be ‘guides not gods’ – Part 1′ written by consultant neurologist, Professor Leslie Findley.